With the rapid development of automobile industry, automobile has become a necessary means of transportation for people to travel, and the problem of automobile transmission is one of the most concerned problems. In addition to some problems affecting NVH and handling performance, there are also some problems affecting driving safety, which may lead to traffic accidents. Therefore, people put forward higher and higher requirements for the safety and reliability of automotive transmission. Needle roller bearings are one of the most dangerous failure modes of transmission, which can cause the vehicle to lock the driving wheels in extreme conditions and cause the vehicle to throw its tail or lose control. There are many reasons for bearing ablation, including clearance fit, strength design, part size processing, cleanliness, assembly process and so on. In order to ensure the normal operation of gears relative to bushes, there must be a certain gap between needle roller bearings and gears and bushes, and ensure adequate lubrication. If the gap is unreasonable or insufficient lubrication, will lead to needle roller bearings and gears and bushes between the operation is not smooth, abnormal wear and heat, at the same time heat generated by high temperature parts heat. The clearance between needle roller bearings and various parts is reduced or even completely eliminated, resulting in motion interference, worsening abnormal wear of bearings, eventually leading to ablation and stuck. According to the assembly position of needle roller bearings, the key dimensions affecting the radial clearance are output shaft diameter, bushing inner diameter, bushing outer diameter, bearing needle diameter, gear inner diameter. The larger the diameter of the output shaft or the smaller the inner diameter of the bushing, the larger the outer diameter of the bushing after being pressed into the output shaft. The larger the outer diameter of bushing, the larger the diameter of bearing needle and the smaller the inner diameter of gear will directly lead to the smaller the bearing clearance. Through disassembly and inspection of the faulty gearbox, it is found that the inner hole of the gear is abnormal wear, the needle of the bearing is ablated and seriously deformed. After inspecting the key dimensions of the related parts (see Table 1), the inner diameter of the bushing is out of range, and part of the dimensions can not be inspected because of the damage and wear of the parts. Inspect the inside of the faulty transmission, the oil channel is not blocked, and the gear oil quantity and oil product of the transmission are not abnormal. Six needle roller bearings are used in each gear of the transmission, such as cleanliness or oil problems, which will not cause the needle roller bearings to be ablated in one gear and other gears will have similar problems. According to the above analysis, the possibility of needle roller bearing ablation caused by poor lubrication and foreign body invasion is basically eliminated. There are many reasons for the ablation of needle roller bearings, such as the intrusion of hard foreign bodies into the bearings, the blockage of lubricating oil passages or the deterioration of lubricating oil, which lead to poor lubrication, unqualified materials of parts, and the small clearance between the bearings and gears, etc. All these factors may lead to the poor operation of needle roller bearings and the occurrence of ablation and damage. According to the disassembly and analysis of the faulty parts, the factors such as foreign bodies, lubrication, material quality and so on are preliminarily eliminated, and it is judged that the reason is the small clearance of needle roller bearings; the structure of the transmission is to make the inner diameter of the Bush fit with the diameter of the output shaft by pressing and assembling, and the clearance of needle roller bearings is not only related to the size of the matching parts, such as The key dimensions of needle roller, such as the diameter of output shaft, inner diameter of bush, outer diameter of Bush and gear hole, are also related to the pressing and assembling process between parts. The key dimension of parts is out of tolerance or the dimension change caused by pressing and assembling may cause the gap between needle roller bearing and gear too small. The pressing process of the shaft is unreasonable, and there is no process pressure alarm device, and the upper limit value of the pressing force is too large to reach 20 kN. Normally, the bushing pressure is not more than 8 kN. When the bushing and the output shaft interference is too large, the pressing equipment will force the bushing into the output shaft through the upper limit pressure, which will lead to the bushing after pressing. 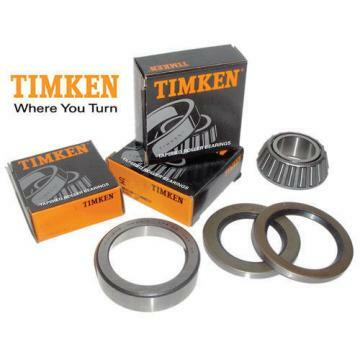 Because of the interference fit between the output shaft and the bushing, when designing the clearance between the needle roller bearing and the gear and the bushing, the expansion of the outer diameter after the bushing is not taken into account, the theoretical clearance will be reduced, when the parts are divided into parts. When it is not in the limit size, the gap between the needle bearing clearance is completely offset or even negative gap occurs. The upper pressure limit is changed from 20 kN to 8 kN, and the process pressure alarm device is added. When the interference is too large and the pressure is up to 8 kN, the equipment will alarm automatically. For the shrinkage tolerance of parts involving radial dimension, the bearing needle diameter is selected to control the Bush and the output shaft. The range of interference and the appropriate increase of the radial clearance of needle roller bearings; Strengthen the control of the size of parts, the key size of 100% inspection and confirmation, to prevent non-conforming products into the follow-up process. By strengthening the control of the key size of the parts, optimizing the pressing process, and optimizing the dimensional tolerance of the parts, the expansion of the outer diameter of the bushing after pressing is obviously reduced and stable;By selecting the needle diameter of the bearing, the bearing fit clearance is further enlarged to ensure that the needle bearing clearance is within a reasonable range and the parts are stable. Quality consistency improved significantly.